Centre Mark Percival is hoping Saints will have learned valuable lessons from the heart-break of two major setbacks last year and will be trying to rectify it in 2019. 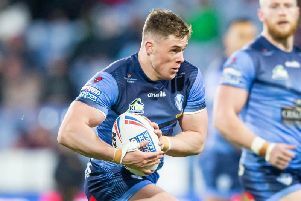 Coach Justin Holbrook’s side clinched the League Leaders' Shield last season but fell short in both semi-finals, losing to Warrington Wolves in the league play-offs and suffering defeat against eventual winners Catalans Dragons in the Challenge Cup. The 24-year-old England international told Love Rugby: “We were good all year but just weren’t good enough at the right times and we've only ourselves to blame for that. Saints have made a perfect start with two wins from as many matches, defeating Wigan Warriors 22-12 and then Wakefield Trinity 24-18 and Percival believes the depth and quality of the squad following the recruitment of overseas players, Lachlan Coote,Kevin Naiqama and Joseph Paulo, will pose a few selection headaches for Holbrook as the year unfolds.